Can Disruptive Tech Fix It? “Software is eating the world,” proclaimed Venture Capitalist and software engineer Marc Andreessen at the 2017 Mobile World Conference in Barcelona, Spain. “With lower start-up costs and a vastly expanded market for online services, the result is a global economy that for the first time will be fully digitally wired—the dream of every cyber-visionary of the early 1990s,” he explained. Andreessen, who co-founded Netscape, was listed as one of Time Magazine’s “Top 100 Influential People” in 2012, and currently sits on the board of directors of Facebook, eBay, and Hewlett Packard, among others. “Companies in every industry need to assume that a software revolution is coming,” he predicted in a 2011 article published in The Wall Street Journal. He was right. It’s here. Since 2000, 52% of the companies in the Fortune 500 have gone bankrupt, have been acquired, or have ceased to exist, due in large part to the disruption of traditional industry models by digital ones. Over 8,600 retail stores could close this year in the U.S.—more than the previous two years combined, brokerage firm Credit Suisse says in a recent report. Meanwhile, e-commerce pure-plays are riding the rise of digital commerce to success—none more so than Amazon, which accounted for 53% of online sales growth in the U.S. last year, according to Slice Intelligence. While a great product is a given for a brand’s survival, it is no longer enough, and as America becomes plagued with “zombie malls,” brands are faced with massive inventory problems, store closures, even bankruptcy. “Many of us who have grown up in the industry recognize that the major contributor to the current malaise started with strategies initiated over 20 years ago,” explains industry veteran George Santacroce, founder of Global Market Solutions, a consulting and research rm that has performed work for retailers and brands in the U.S., E.U., India, and Asia. Santacroce’s credits include CEO of The Collective, a luxury department store in India, and VP of Bergdorf Goodman, the luxury department store where he started the Bergdorf Goodman Men’s Store. “These strategies have resulted in too many malls and stores, too many brands and sub-brands, too much inventory, too many price options, and product life cycles that are too long and too costly,” he says. Digital interactions with retail are the new norm. Consumers are now in charge of brand relationships; their experiences are driving new brand behaviors, and they expect perfection with digital interactions. Customers own the technology to do this—and have for a decade (the first iPhone was launched in 2007). “With the consumer’s ability to control experiences—what they buy, where they buy it, and what they want to pay for it—this is forcing the industry to rethink the channels in which we engage with consumers,” Santacroce says. “These won’t replace brick and mortar, but we need to think about mobile, online, and in-store holistically. We need to be prepared to interact and engage with consumers in the same quality and context that meets the expectations of the consumer,” he says. Too much inventory, too many price options, too many brands and too many sub-brands have resulted in an oversatuaration of the retail market, leading to the decline of traditional retail. The consumer path to purchase includes digital and physical brand interactions. The digital path to purchase must be simple, and this channel is a chance to inform, engage, and acquire new consumers. And that digital dialogue equals loyalty: 40% of consumers won’t go into a store unless they can go online first; over 80% have been online at least two days before entering a shop; a brand’s website plays an important role for 69% of purchases; and 49% of purchases are heavily influenced by digital. For brands, this is an opportunity to meet customers at their moments of intent, when decisions are being made or preferences are being shaped. And personal engagement leads to loyalty. “65% of the E.U. discover beauty online,” says Amy Kean, vice president of Transformation at Coty, at a November 2017 event in London focused on “The Digitalization of Beauty” sponsored by the luxury digital agency Verb Brands. Coty has a global portfolio of 77 fragrance and beauty brands, including CoverGirl, Clairol, Rimmel London, OPI, and Philosophy. “Beauty is the most personal industry, and at Coty it is all about personalized retail,” Kean says. “Personalization drives conversion up by 35%,” she explains. Social listening is key to Coty’s social media strategy, she explains. Marketing teams monitor trends via Scout, a proprietary software created in-house that identifies trends in visual content across influencers. The marketeers then create content relevant to these trends. For example, pink drinks for summer 2017 resulted in pink makeup nail and lip looks for the relevant brands’ Instagram posts. “To better target advertising, customer data from Instagram helped Glossier [a U.K.-based beauty brand] deliver a clear brief to marketing creatives on who their customer is and what they want,” explains Charlotte Parks-Taylor, Director of Strategy and Insight at Cream U.K., a strategic media and communications agency specializing in connecting brands to affluent audiences. “Conversational commerce” has been available in Asia since the launch of WeChat, with What’s App, Facebook Messenger, and other E.U. and American telecoms either launching or piloting this year. “At Boodles [jewelers], in-store staff are able to interact with consumers who are online,” Parks-Taylor says. “These interactions are monitored so that A.I. [Artificial Intelligence] learns how the Boodles consumer wants to be spoken to,” she explains. Last year, ModiFace, an Augmented Reality (A.R.) company that creates custom try-on apps for the beauty industry, integrated simulation technology with chat bot technology on Facebook Messenger to help consumers choose lipstick. With knowledge of 20,000 beauty products, the bot enables users to discover items by chatting about colors and brand names. By uploading a selfie directly into the chat, they can then try on product virtually. Using advanced facial tracking and simulation technology, the consumer can see what they look like in that exact product. Products can then be purchased without leaving Facebook Messenger. According to Kean, Coty will soon be launching chat bot chat experiences for recommendations based on customer data, A.I. and Machine Learning (M.L.). Virtual tools can assist shoppers in making decisions while helping brands avoid having too much inventory. The convergence of gaming, movie, and 3D fashion tech offers brands and retailers an entirely new business model—start first with digital. Italian cycling brand Alé, and Italian fast fashion menswear and womenswear brand Imperial Fashion currently sell direct-to-consumer from 3D simulations. 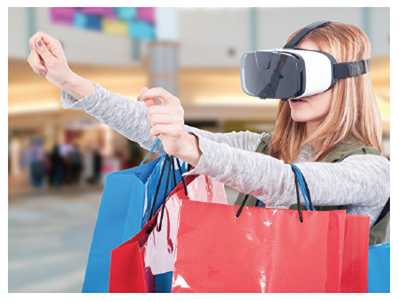 Digital simulation at retail is more than lowering sample costs; digital simulation at retail offers the opportunity to get inventory right—right product, right price, right location—by giving the consumers what they want, when they want it. “As digital consumers, we are used to instant gratification, and we want product that is personalized and relates to our specific needs and lifestyles,” explains Asaf Landau, vice president and general manager of EFI Optitex. “There is no dominant technology player driving the digital transformation of apparel,” he says. “Open platforms that allow us to design in 3D, lay out in 2D, and print digitally with color accuracy, [which] allows for mass personalization with less waste, more efficiency, and faster speed to the consumer,” he explains. “V.R. (Virtual Reality) and A.R. necessitate 3D,” Landau says. “3D is the gateway drug to the digital addiction of the future consumer,” he jokes. “We are working with retailers now to gain insight about customers in-store without an app, using visual recognition,” says Retail Director of Hitachi Consulting, Mark Williams. Reformation, a womenswear brand and retailer with stores in New York, California, and Texas, have installed interactive screens in some of their flagship stores and equipped staff members with mobile devices that allow customers (or staff members) to create personalized fitting rooms. Inventory on the shop floor is for display only. Sizes are located elsewhere. a touch screen in her fitting room (or via the sales assistant’s mobile device), she places product she no longer wants in the wardrobe and this is “magically” returned to stock and replaced with whatever has been requested. Store operations are simplified so that sales associates can focus on styling and helping customers instead of store clean up. But the real advantage is that the brand gains valuable in-store data on what the customer likes and dislikes based on her fitting room session. This data then allows the design team in the head office to make and ship more of what’s popular, and stop creating products that aren’t selling. Reformation produces most of its product in California, and ships new collections to stores in as little as two weeks. Farfetch, an online fashion retail platform that sells more than 700 luxury brands globally with no inventory, launched Farfetch OS, a suite of software applications that are designed to capture in-store consumer behavioral data. In the physical world, mobile devices capture physical location data, and in the digital world, mobile devices capture data on where we’ve been in the digital world, explains Tom McLaughlin, data science and predictive analytics leader. When these are combined, we get contextual data, he says. And it is this contextual data that allows data scientists and analysts to predict when a consumer is likely to buy. As an example, he cites getting on an airplane for a long-haul flight as an opportunity for an insurance company to offer travel insurance. Harnessing in-store data and combining it with online behavioral data gives retailers the ability to predictively sell—as opposed to basing future sales on history. “In the FMCG [Fast Moving Consumer Goods] sector, manufacturers deploy people to the field to ensure store shelves are stocked,” Williams explains. “But now, with IOT [Internet of Things] sensory mats on shelves, not only can store replenishment and stock re-orders be automated, but analysis of which shelf is performing better, and store-to-store comparisons can be performed in real time,” he explains. While this tech deployment has previously been focused on grocers and other FMCG, the focus is now turning to apparel and accessory brands. With ESEL, when product pricing is loaded into the point of sale, the labels on the shelves are uploaded at the same time. Retailers then have the ability to change prices in real time. “This goes far beyond markdowns and promotions,” Williams says. 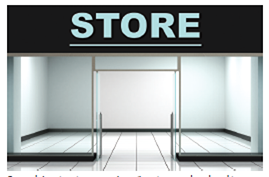 “A retailer can o er lunch time specials for categories of product instead of everything in store,” he explains. Digital services can drive in-store sales. Notifications can also be sent to customers to drive footfall in store. “Sensors outside of stores can help retailers target—in real time—customers who are nearby,” Williams explains. “Footfall is still really important,” says Dan Ballin, founder and CEO of Ideas Crucible, a firm that helps entrepreneurs grow and corporations innovate. “Some have predicted that online will plateau by 2020,” he says. One of the startups Ideas Crucible is working with is Shopest—a location-based tech platform that makes nearby retailers searchable and shoppable. “The platform takes the best part of online to help the offline part of a brand,” Ballin says. “It makes discovering nearby retail fast and simple. You select brands you like, items you like, sizes you require, and when you are near a retailer that has what you’re interested in, the app notifies you.” This could be within department stores, malls, or main shopping streets, Ballin explains, because it works through seamless integration with a retailers inventory. Operational in Dubai and London, the Shopest platform will soon be available in New York. The company LikeAGlove also helps match consumers with brands—specifically jeans that fit. Consumers purchase smart leggings embedded with technology that measures high waist, low waist, high hip, and low hip. The leggings transmit measurement data to an app that then matches the consumer shape to a number of brands: Levi’s, Lucky Brand, Old Navy, 7 For All Mankind, Gap, Citizens of Humanity, American Eagle, Ann Taylor, True Religion, and more. Amazon’s recent acquisition of Body Labs, a software provider of human-aware artificial intelligence that understands the 3D body shape and motion of people from photos or videos, has many speculating on how quickly body imaging technology will improve and influence online shopping. Since 2008, Metail has been offering size and style advice to online female shoppers based on Body Modelling and 3D Modelling. Consumers get a simulated version of themselves that takes into account size and weight. A M.L. algorithm provides data to fashion bots continuously from a customer base of nearly eight million users—most of whom are based in Asia. 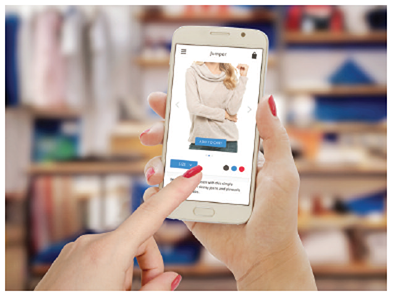 Since launch, Metail has digitized more than 80,000 garments for virtual try on. Earlier this year the company received £10million in Series B investment and plan to launch a men’s service later this year. The company also provides data from customer interactions back to retailers as a service. Consumers in the beauty industry have been trying on makeup looks from L’Oreal’s Make Up Genius app since 2015. Facial tracking technology allows a user to try on different make up looks, share the images, and buy the products. Maybelline’s Colorshow A.R. was created by Blippar, a firm specializing in A.R. and Computer Vision (the field within A.I. that understands sight). By harnessing these technologies, Bilppar bridges the physical and the digital to push the boundaries of visual search and user experience. Using the Blippar app, a customer can aim her smartphone at the relevant Maybelline print ad to unlock a try on feature that allows the customer to see how her hand will look in 40 shades of Maybelline’s nail polish. “Although launched nearly 3 years ago, Colorshow still has an average of two minutes of engagement time,” says Mikela Eskenazi, Commercial Director Blippar. While the app was designed to help customers see how a color looks against skin tone, the data collected has helped Maybelline understand what colors are popular, driving stock to store inventory in areas where the app is in use, she explains. Also powered by Blippar and deployed to more than 300 Boots/Walgreens stores, Max Factor’s “Beauty Consultant In Your Pocket” gives a user product information, tutorials, and customer reviews by scanning any of 500 Max Factor products. And while the thought of undertaking A.R. on such a large scale may seem daunting, in this case, content for the app was already created for other online channels, Eskenazi explains, making the app the amalgamation rather than creation of content. “Facial recognition is becoming key as a personalization tool,” Eskenazi says. “With A.R., A.I., and M.L., it’s possible now for an app to understand the mood, patterns, and features of a consumer to recommend the right product, and help her to step-by-step apply makeup based on the shape of her face.” In the future, an app may even recognize that a consumer is tired and then recommend a product in real time to help her look refreshed. At WalMart, facial recognition is being tested to determine if customers waiting in line are unhappy with the wait, and the data could direct sales associates to help those frustrated with their in store experience. In the E.U., MasterCard is rolling out its Identity Check App—dubbed “Selfie Pay”—allowing consumers to authorize payments via facial recognition through their smartphone cameras. In Bejing, Kentucky Fried Chicken is piloting Visual Recognition to predict customer orders based on age and gender. Over time, M.L. will enhance the experience by predicting return customer orders based on their order history. In the U.S., a major pizza chain uses Visual Recognition to assure quality is consistent—for example, does each pizza have the correct amount of pepperoni? Visual Recognition tech powers RealCadence by VoloForce, a software firm offering cloud-based retail operations software as a service (SAAS). The software helps retailers to ensure that all point-of-sale collateral and window displays globally are displayed according to brand guidelines. A photo of a shop window can be uploaded into the cloud data-base that checks the visual against quality guidelines and immediately approves or offers correction about the installation. 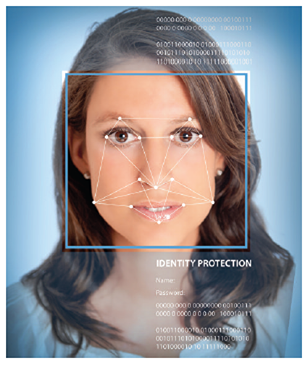 Facial recognition can help businesses gauge customer satisfaction and willingness to buy. The same pizza chain that uses Visual Recognition to assure quality, also ties M.L. with Voice Recognition so that when consumers tell their Smart Home Devices (Amazon Echo/Goole Home/Apple HomePod) to order pizza, the restaurant is notified of a predicted order—while the consumer is still ordering—so that the restaurant can begin making the pizza immediately, reducing delivery time. Banks in the U.K. use voice recognition to withdraw money. Can Voice Activated chat bots soon help consumers shop, guide them through stores, and make recommendations? According to Andreessen, “Mobile First” is soon to be replaced with “Machine Learning” first. So Why is is So Hard for Most Retailers? In the end, it’s the people, not the tech, that delay deployment. At a recent Hitachi IOT retail futures dinner in London, most brands who attended cited changing ways of working, mobilizing people, and organizational structure as challenges to strategically thinking about and effectively implementing tech and new data analytics models. Disruption is frightening, and without leadership buy-in driving it from the top, change is daunting and hard, they say. In just 16 years, the entire music industry was transformed to a complete digital model (Apple launched iTunes in 2001). When embraced, digital ecosystems create new products, new distribution channels, and new revenue streams. Which retailers will survive the next 16 years? Craig Crawford is founderprenuer of Crawford IT, a London-based consulting firm specializing in the digital transformation of brands; Twitter @getamobilelife; +44 07834584785. Disclaimer: Responsibility for opinions expressed in this article is that of the author and quoted persons, not of DLI. Mention of any trade name or proprietary product in Fabricare does not constitute a guarantee or warranty of the product by DLI and does not imply its approval to the exclusion of other products that may also be suitable. reprinted here with copyright permission from AATCC.